On November 24, 2008, Hassan received the Space Flight Awareness Honoree Award. Syed Hasan (BS'04), a graduate student in the Department of Aerospace Engineering, was recently honored twice within a one month period! On November 24, 2008, Hasan received the Space Flight Awareness Honoree Award, which is one of the highest presented to NASA and industry and is for first-level management. This award is presented to employees for their dedication to quality work and flight safety (NASA.gov). 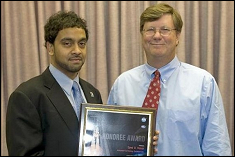 On December 18, 2008, Hasan received the Space Flight Awareness Team Award. This award is used to recognize small groups of employees that have demonstrated exemplary teamwork while accomplishing a particular task or goal in support of the human space program (NASA.gov). Hasan is currently working at the Flight Dynamics Facility at NASA Goddard Space Flight Center as a Systems Engineer involved with shuttle and rocket launch support. The Clark School extends its congratulations to Mr. Hasan for his accomplishments.